Dave Terrell was born on November 10, 1933, in Buena Vista, Virginia. He enlisted in the Aviation Cadet Program of the U.S. Air Force on March 18, 1953, and was commissioned a 2d Lt on June 30, 1954. Terrell was trained as a Radar Intercept Officer on the F-94C Starfire and then served with the 46th Fighter Interceptor Squadron at Dover AFB, Deleware, from June 1955 to August 1957. Lt Terrell then completed Bombardier-Navigator training and B-52 Stratofortress Combat Crew Training before being assigned to the 40th Bomb Squadron of the 6th Bomb Wing at Walker AFB, New Mexico, from April 1958 to October 1959. 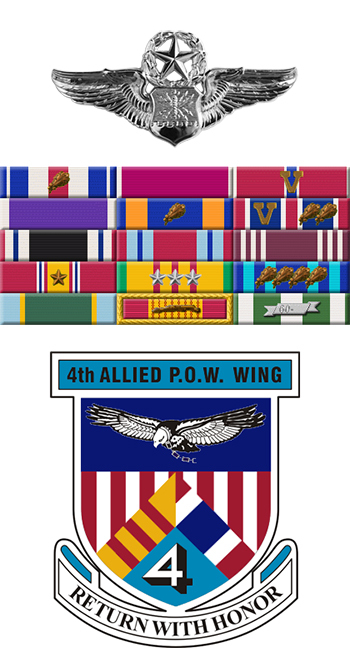 He served with the 492nd Bomb Squadron and then the 736th Bomb Squadron of the 4228th Strategic Wing at Columbus AFB, Mississippi, from October 1959 to September 1966. During this time, Maj Terrell completed 31 combat missions in Southeast Asia between November 1965 and March 1966. His next assignment was an Education-With-Industry Program at Boeing in Seattle, Washington, from September 1966 to November 1967. He completed EB-66C Destroyer Combat Crew Training in December 1967, and was assigned to the 41st Tactical Electronic Warfare Squadron at Takhli Royal Thai AFB, Thailand, from late December 1967 until he was forced to eject over North Vietnam on January 14, 1968. He managed to evade his enemies for two days before being captured and taken as a Prisoner of War on January 16, 1968. After spending 1,886 days in captivity, Col Terrell was released during Operation Homecoming on March 14, 1973. He was briefly hospitalized to recover from his injuries at Maxwell AFB, Alabama, and then attended Air War College at Maxwell from August 1973 to August 1974. 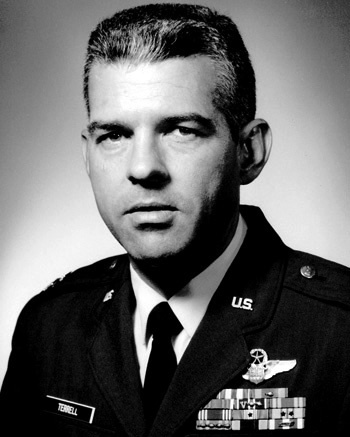 His final assignment was as an Aerospace Maintenance Director at Warner Robins AFB, Georgia, from August 1974 until his retirement from the Air Force on March 31, 1975. Dave Terrell died on October 14, 2006. Dave and his wife Charlene had four children from previous marriages-Jenny, David, Lyta, and Stephen. Major Irby D. Terrell, Jr. distinguished himself by gallantry in connection with military operations against an opposing armed force over North Vietnam on 14 January 1968. On that date, Major Terrell, by his outstanding display of professionalism and courage in the face of hostile fire from unfriendly forces, was highly instrumental in the overall success of the air operation. By his gallantry and devotion to duty, Major Terrell has reflected great credit upon himself and the United States Air Force.